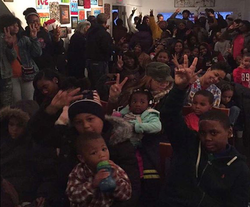 The Urban Art Gallery is a 501(c)(3) non-profit organization that is committed to providing Philadelphia youth with FREE multi-faceted arts and culture programs. It is widely reported that children who are exposed to the arts are more likely to do well in every aspect of school and life in general. Our goal is to ensure that our youth are exposed to the arts and various cultural experiences so they will go on to live happier and more productive lives. Below are some examples of the programs we're running but we are constantly adding new programs and new program partners. If you're interested in running a program with us, please send an email to Karl Morris at km@urban-artgallery.com. NOTE: The details and schedule of Youth Programs at the Urban Art Gallery are subject to change based on partner availability. For the most up-to-date information, please subscribe to our YOUTH PROGRAMS email list. Sign-Up to get information on our Youth Programs! Chess & Chat is a partner program with Childhood Lost Entertainment (CHL) that seeks to teach children the fundamentals of Chess while engaging them in ongoing mentorship. Art Buds is an 8 week Visual Arts course taught by renowned artist, Shanina Dionna. The course covers multiple disciplines and focuses on helping children find their creativity. The UAG Music Program partners with talented local musicians in an effort to introduce children to musicianship. Each season features a different instrument and instructor. The Cultural Field Trip is a great opportunity for children and adolescents to experience arts and culture in a museum setting. These field trips are not limited to Philadelphia. 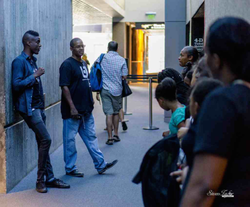 Every Summer, the UAG invites neighborhood camps to the gallery to enjoy a fun storytelling experience. Our goal is to promote literacy, listening skills and phonological awareness.